You can use Outlook or Outlook on the web to schedule an online meeting the same way you schedule meetings normally but with one or two extra steps. You can use either Skype for Business or Teams, depending on what's supported in your organization. If your account is configured for dial-in conferencing, the online meeting request will automatically include call-in information (phone number and conference ID). Skype for Business Online users: If you don’t use Outlook or Outlook on the web, you can set up new meetings by using the Skype for Business Web Scheduler. On the Home tab, select New Meeting . Add online meeting information by selecting Teams Meeting or Skype Meeting. Note: Which is available depends on your organization. If your organization uses Skype for Business, see install Skype for Business. If your organization uses Teams, the add-in will be installed automatically. Continue setting up the meeting as you normally would. See Schedule a meeting with other people for details. To look for a time that works for everyone, select Scheduling Assistant, in the Show section on the Meeting tab. In the meeting area, you can add an agenda. Be careful not to change any of the online meeting information. If you're setting up a Skype Meeting, you can use Meeting Options to customize the meeting settings. (Optional) If you're using Skype for Business, you can preload your meeting attachments. That way, when participants join the meeting, everything is ready to go. See Preload attachments for a Skype for Business meeting. Double-check the information and select Send. On your Mac, open Outlook, and then switch to Calendar view. Choose Skype Meeting or Teams Meeting. For Skype meetings the call in info is added immediately to the meeting invite. For Teams meeting details will be added to the invite once the meeting organiser sends the invite. You will see Skype or Teams depending or what your organisation uses for communication. If you’ll have in-person attendees, either select Room Finder, in the Options section on the Meeting tab, and then find a room, or in the Location box, type a meeting location, such as a conference room. 5. In the meeting area, type an agenda. Be careful not to change any of the Skype for Business meeting information. 6. Double-check the information, and then select Send. The instructions are slightly different depending on whether you're using the new Outlook on the web. 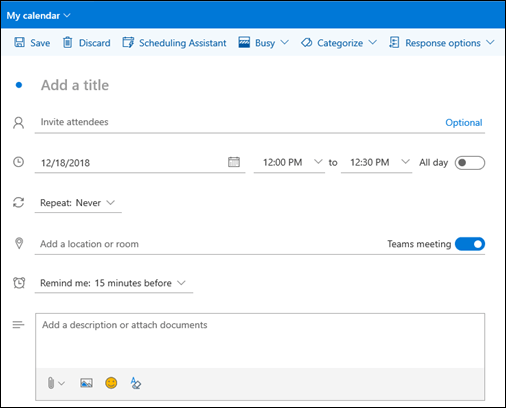 See Set up an online meeting using the new Outlook on the web. See Set up an online meeting using classic Outlook on the web. To create an online meeting request in Outlook on the web, start by signing in to Outlook on the web. If signing in doesn't take you directly to your Mail, select Outlook. After you've signed in and are in Mail, select Calendar. On the calendar page, select New event. In the window that opens, you might see one of two options: a toggle to make this a Teams or a Skype for Business meeting, or a drop-down list that will let you choose either Teams or Skype. The option you see is determined by your administrator. Fill in the meeting information as needed, including meeting attendees. To create an online meeting request in classic Outlook on the web, start by signing in to Outlook on the web. If signing in doesn't take you directly to your Mail, select Outlook. On the calendar page, select New > Calendar event. 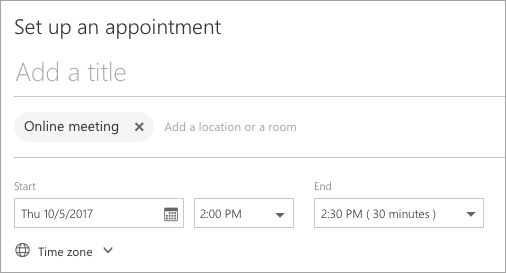 On the Set up an appointment page, select Add Skype meeting. Fill in the meeting title, location (if you'll have in-person attendees), and the start and end times. Choose the people to attend, add the agenda or other meeting information, and then select Send.